At the Neighborhood Council of Westchester / Playa meeting on April 4, Los Angeles Police Department Burglary Detective Robyn Salazar provided residents with a crime update and encouraged them to stay vigilant against a new wave of burglars who are seeking soft targets. Burglaries have increased significantly since the passage of Proposition 47, she said, because burglars who used to get as much as seven years in prison for their crimes now find themselves back on the streets in a matter of months. After years of being in limbo following civil rights litigation, the City of LA is making another attempt at regulating vehicle dwelling with the passage of LAMC 85.02 in January 2017. This ordinance is by its terms temporary and expires on July 1 2018, unless extended. There have been many reports of coyote sightings and animal attacks in Kentwood and the surrounding neighborhoods, as can be seen on this map set up by some concerned neighbors. Residents are being warned to keep their animals inside. Even small animals using doggy doors for access to your backyard are at risk. Coyotes can reportedly jump six foot fences from a standing position and eight foot fences with a running start. Attacks are being reported at all times of the day and night. If confronted by a coyote, it is advised that you don’t turn your back and run, as they will give chase and attack. Experts advise that you should face the coyote head on, waving your arms, yelling and/or blowing a whistle. Under no circumstances should you feed coyotes. Feeding them lowers their fear of humans and is illegal. Please don’t leave pet food unattended and available. To add sightings to the map, email CoyoteWatch911@gmail.com. Animal services can be contacted at 888.452.7381. For more information about coyotes, this collection of resources has been put together by neighbors. A small group of neighbors has been meeting recently with Mike Bonin to discuss health and safety concerns related to RV’s parked in and around Westchester, but specifically on Manchester along Kentwood’s boundaries. He asked us to gather evidence of health and safety issues so that he can bring them to LAPD and DOT to press for extra patrols and enforcement, as well as restricted parking signs. One set of signs restricting overnight parking has been installed on Manchester between Emerson & Kentwood, and another set is due to be installed between Kentwood and Sepulveda Westway. A request for additional signs between Emerson and Georgetown is due to be submitted shortly. Reminder! KHG Safety & Security Event Is This Week! KHG is hosting a Safety & Security Forum on Tuesday evening. Featured speakers include LAPD, LAFD and Neighborhood Watch. Topics include getting ready for El Nino, recent crime stats and how we can work together to make our neighborhoods safer. Home security vendors will be on hand to answer questions. Everybody is welcome. Please share with your networks. Bring your questions! See you there?? Save the date! 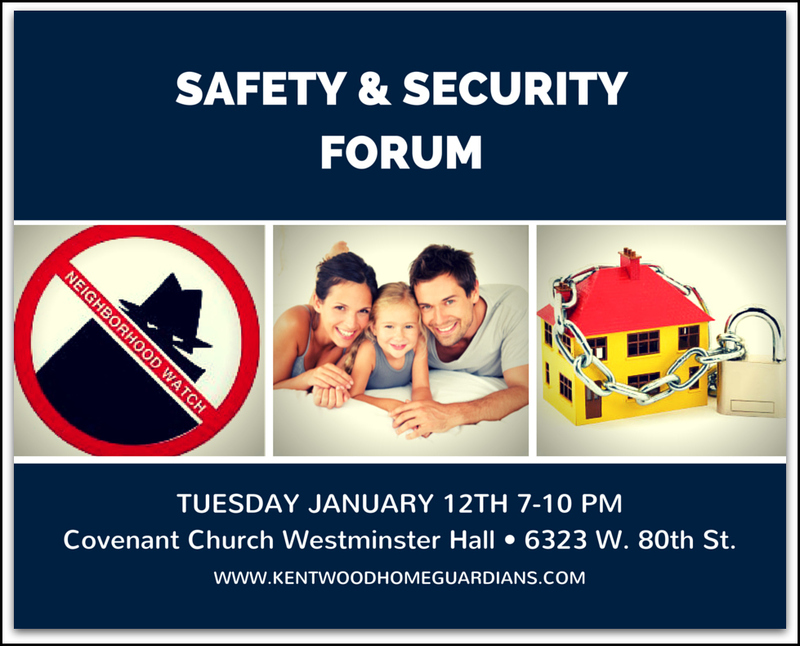 Kentwood Home Guardians is hosting a Safety & Security forum and it’s open to the public, so bring your friends and neighbors! Representatives from LAPD and Neighborhood Watch will be on hand to speak. Home security vendors will have tables and be available for questions about home security.